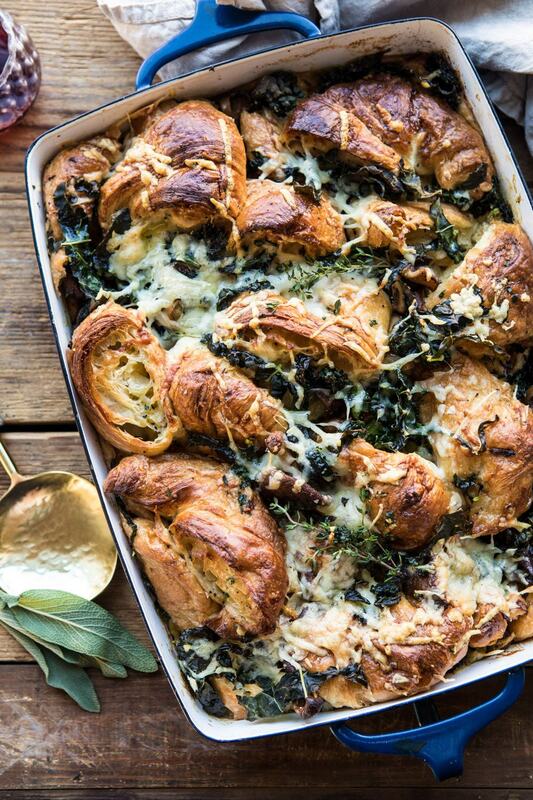 Upgrade this year’s holiday stuffing with my Herby Mushroom Croissant Stuffing. 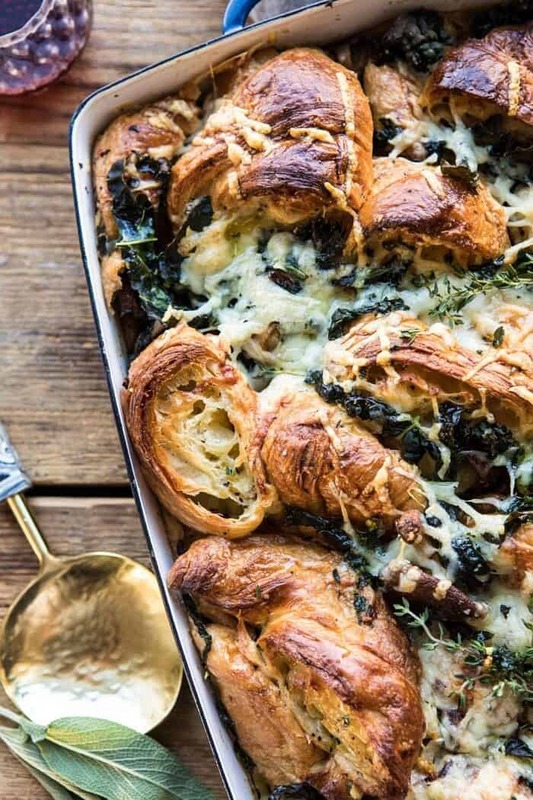 Buttery croissants, cozy herbs, caramelized wild mushroom, kale, and Gruyère cheese take classic stuffing from bland and boring to flavorful and completely delicious. Even stuffing haters love this casserole. It’s just as good as a holiday side dish as it is a meal. Prep this stuffing in advance and then bake up just before you’re ready for dinner for super easy holiday entertaining. Stuffing has never been a highly cherished Thanksgiving side dish for my family. I know that sounds crazy, since stuffing is one of the most classic Thanksgiving sides there is. But for whatever reason my family has just never been all that into it. In the last few years however, I’ve had to cook Thanksgiving for a lot of non family members. And because I love to please all, I knew that my Thanksgiving menu needed to include a good stuffing. 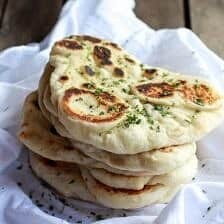 I’ve tried more classic recipes, but never found anything I absolutely loved. When I was thinking up this year’s Thanksgiving menu, and brainstorming stuffing concepts, I had just made a recipe that used croissants as the base. I had a ton of day old croissants left over, so I decided to do a quick stuffing test run with the ingredients I had on hand. Pretty much immediately, I knew the recipe was going to be good. I mean? Croissant stuffing? With wild mushrooms and kale and Gruyère cheese? It’s basically a meal on its own, and it’s all things delicious. Like most stuffing recipes, you want to be using dry bread. 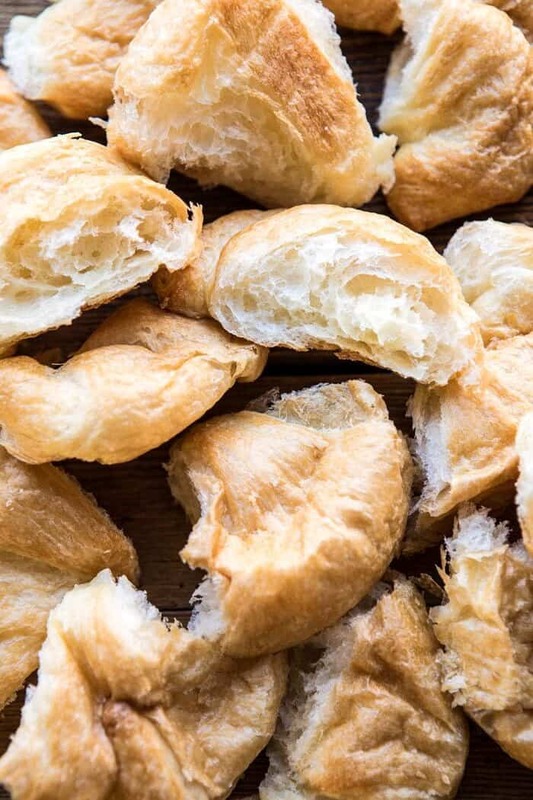 The key here is to toast your croissants up in the oven to dry them out a bit before adding any broth to them. This helps them hold up while baking, and gives them a nice crispness. While that’s happening, caramelize the mushrooms with butter, fresh sage, thyme, and a good amount of kale. I love using a good mix of vegetables in my stuffing to give it color, flavor, and texture. 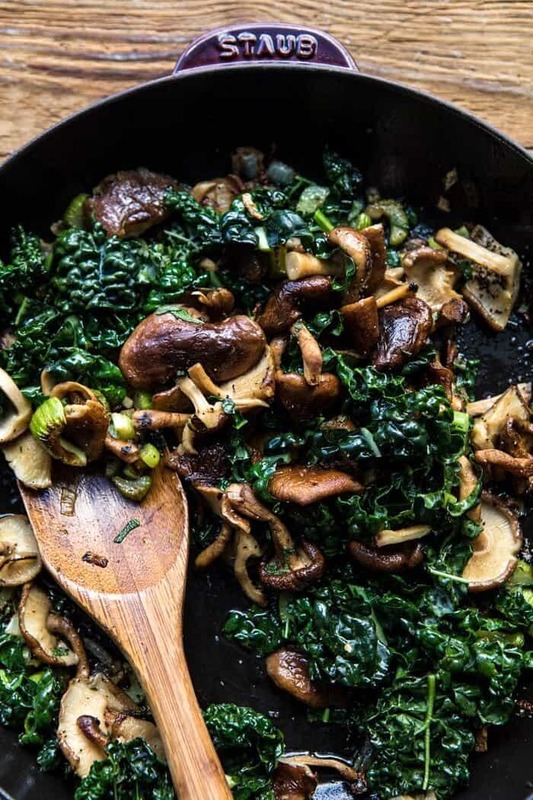 The warming sage and thyme pair perfectly with the earthy mushrooms and kale. It’s one of my favorite fall combos and perfect for a Thanksgiving meal. Once your croissants are toasted, toss them with the mushroom mixture, add cheese, and then bake. Nothing too fancy, but the use of croissants is such an upgrade from the classic stuffing. And I have to say, everyone loved this dish. I ended up serving the leftovers to my family and they ate it multiple nights in a row. The verdict was two thumbs up all around, and everyone agreed that the croissants are a game changer. 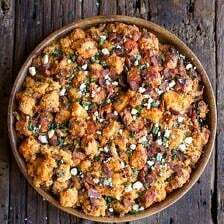 Already excited to serve this pretty stuffing on Thanksgiving next week for the family we have coming into town. Also, I’m not a stuff the stuffing inside the turkey kind of person. I much prefer to bake my stuffing separately. One of the most delicious details of this recipe are the crisp, cheesy croissants on the top layer. They’re mouth-watering and so good, and my favorite part of the dish. For that reason, I’m not advocating placing this stuffing inside your bird. If you make this stuffing be sure to leave a comment and/or give this recipe a rating! Above all, I love to hear from you guys and always do my best to respond to each and every comment. And of course, if you do make this recipe, don’t forget to also tag me on Instagram! Looking through the photos of recipes you all have made is my favorite! 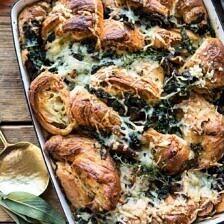 Buttery croissants, cozy herbs, caramelized wild mushroom, kale, and Gruyere cheese take classic stuffing from bland and boring to flavorful and completely delicious. Prep this stuffing in advance and then bake up just before you're ready for dinner for super easy holiday entertaining. 1. Preheat the oven to 350 degrees F. Grease a 9x13 inch casserole dish. 2. Arrange the torn croissants in the baking dish and lay 2 tablespoons of thinly sliced butter over the croissants. Transfer to the oven and bake 5-8 minutes, until the croissants are lightly toasted. 3. Meanwhile, heat the olive oil In a large skillet over medium heat. When the oil shimmers, add the onions and cook until fragrant, about 3-5 minutes. Add the celery and mushroom, and season with salt and pepper. Cook undisturbed for 5 minutes or until golden, stir and continue cooking until the mushrooms have caramelized, 3-5 minutes. Reduce the heat to medium. Add the butter, garlic, kale, sage, and thyme. Cook, stirring occasionally until the kale has wilted down, about 5 minutes. Remove from the heat and set aside. 4. In a very large mixing bowl, whisk together 2 cups broth and the eggs. Add the toasted croissants and the mushroom/kale mixture + all the butter left in the skillet, gently toss to combine. If the mix seems dry, add addition broth, 1/4 cup at a time until all the bread is moist. Pour the mixture into the casserole dish. Top evenly with cheese. 5. Cover the dish with foil and bake for 35 minutes. Remove the foil and check for dryness, if needed drizzle over extra broth, 1/4 cup at a time, to keep things moist, then continue baking for another 10-15 minutes or until the stuffing is golden on top. Serve warm. This can be made assembled a few hours ahead of time and kept in the fridge. Allow the stuffing to come to room temperature before baking. Butternut Squash and Sun-Dried Tomato White Lasagna. So glad you like this! Thank you Rebecca! This is definitely THE best stuffing upgrade. Amazing. ooooh yum, this sounds soooo good!! 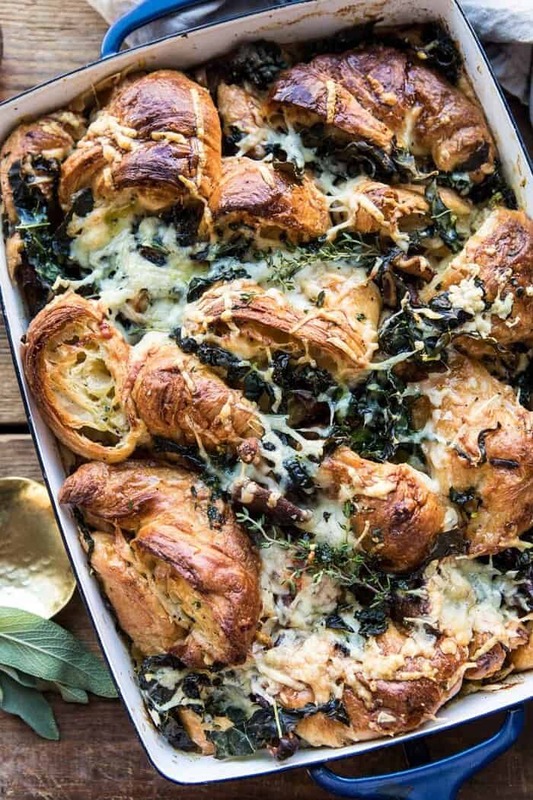 Oh this looks so delicious – are not croissants the best things for stuff like this (I make bread pudding with them! 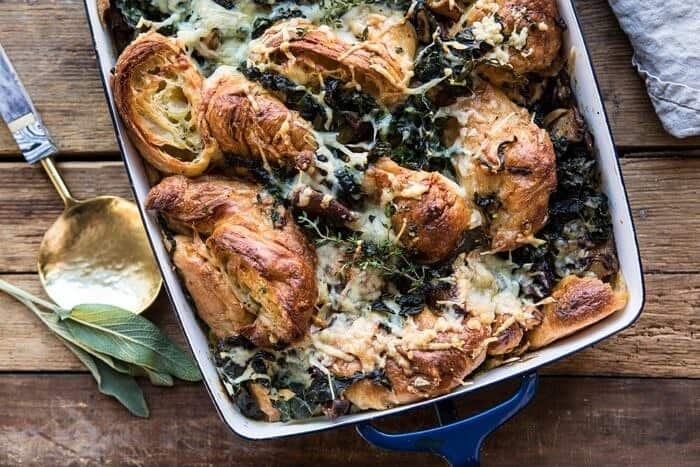 https://www.rachelphipps.com/2014/05/recipe-leftover-croissant-pudding.html) – must roast a chicken as an excuse to make this with one of my cheese substitutes as we don’t do Thanksgiving across the pond! YUM!! That bread putting sounds amazing Rachel! I hope you definitely do try this and enjoy it! This looks really good! Unfortunately, I cannot eat kale. What can I substitute? Spinach? Thanks. Luckily I don’t have to cook this Thanksgiving (I’ve been invited out) but I will definitely be making this dish during the Christmas season. Going to try your popovers also. Can’t wait to try it. You’ve outdone yourself this time! Thank you so much Patricia! I hope you love both of those recipes around Christmas time! Looks great, Tieghan! I am not tied to any stuffing recipe and like trying different varieties. 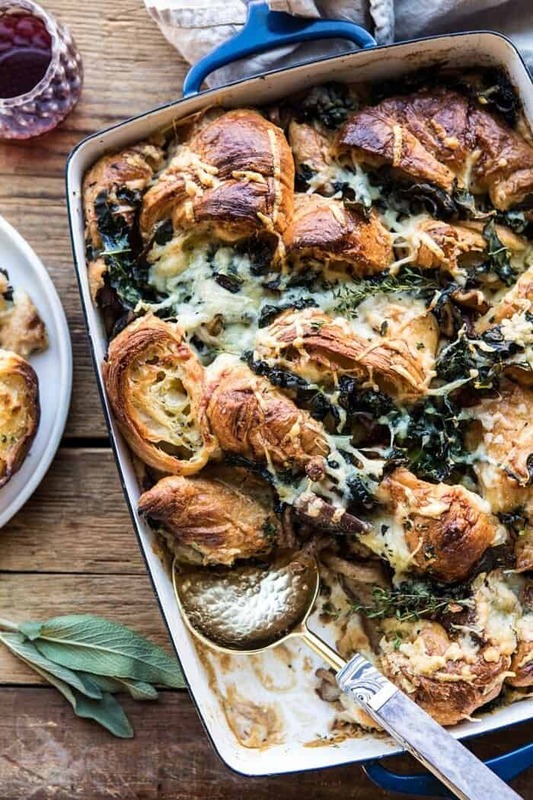 This one is my favorite so far: https://www.foodnetwork.com/recipes/food-network-kitchen/butternut-squash-mushroom-stuffing-3364181 (with spinach or kale instead of collards and a really hearty bread), but I may have to give this croissant option a try! Thank you so much Katie! I hope you try this stuffing! Interesting looking stuffing. Looks really tasty and different. Will make this season. I’m with you. Bake the stuffing. Love croissants. Very creative. Thank you so much Joyce! I hope you love this stuffing for the holidays! This looks fabulous. I’m vegan so would either omit the cheese or use vegan cheese but I can’t wait to try. I hope this turns out amazing for you Deborah! Thank you! Can’t wait to try this! 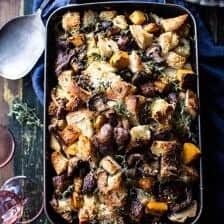 stuffing is one of my favorite sides for Thanksgiving and I love croissants, so this combo sounds like an excellent idea. Sounds so perfect for you! I hope you love this recipe Agne! Haha you’re too sweet! I hope you try this stuffing, Barbara! Thank you! I can verify that my husband, Mike, and I both had HAPPY BELLIES 🙂 and multiple helpings when you prepared this dish for us the other night! The flavors incorporated within this stuffing work so well together and create a DELICIOUS dish! This will DEFINITELY be on our holiday menu this year and many years to come…as well as many of the other recipes you have posted! 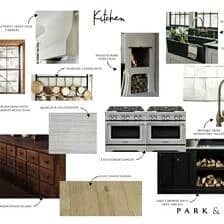 😉 THANK YOU for ALL of the MANY HOURS you work EVERY SINGLE DAY (trust me, everyone, all she does is work) to provide others with SCRUMPTIOUS recipes and FANTASTIC ideas for entertaining! We LOVE you and your PRECIOUS family! Hi Melissa! This is so sweet! I was so happy to make it for you guys and I am so glad you loved this! I hope it turns out amazing for you on the holidays as well! We all love you two as well! My darling, this is not stuffing. It’s dressing. Regardless, it’s a beautiful dish. This recipe looks amazing; I’m eager to give it a try. Any advice on whether the dish can be made in advance, at least in part? I worry that the croissants will lose their texture, but I need something I can prep and transport to where we’ll be eating. Thanks! This looks incredible!!! I’d love to make this next week for Thanksgiving. Its definitely a lot of servings for the amount of people that will be here. If I don’t cut the recipe in half, do you think it will freeze well or no? Hi! !’ How far in advance can you prep??? 🙂 it looks awesome!! To make ahead would you suggest refrigerating, like overnight? Or will the croissants get soggy? So has anyone actually made this and could share their tried comments? seems like most comments are not about the outcome.Those would be most helpful. Hi Jennifer! 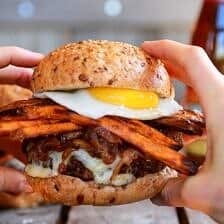 A lot of the comments come from people loving the post and the photos, not just the recipe. I hope you try this recipe and enjoy it! Thank you!! Hi! Any substitute for the kale? PS..I tell everyone to look at your blog/book as EVERYTHING I have made is delish! Happy Thanksgiving! Looks delicious! 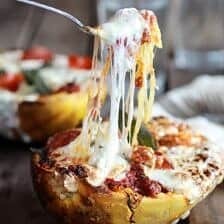 What brand is the pan you are using for this recipe? Hi Jenna! Check out my shop page on the site, I will leave a link below! You can find almost anything you’re looking for! Thank you! 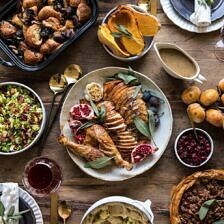 Tieghan–My mom and I are ready to get Thanksgiving 2018 started and using your menu to guide us…naturally. I happen to be allergic to egg, but this stuffing sounds almost too good to be true. Do you have a suggestion for a substitute on the eggs in your herby mushroom croissant stuffing? clear directions on how much butter where to use. I end up using half stick on croissants and maybe a tablespoon on veggies. At the end flavor was good, but stuffing was very rich ( buttery croissants+butter+cheese). I would make this again, but with less butter and cheese. Thank you. Hi Agne! Thank you so much for making this and I hope it turns out even better the next time you make it! Thank you so much and please let me know if you have any questions! Made this for Friendsgiving – IT WAS AMAZING! Very highly recommend. I used butter croissants so cut out some of the butter in the recipe. I am so happy to hear that! Thank you so much Jessica! So delish! Fed this to my friends for Friendsgiving last night and it was a hit. I used Jarlsburg. Geese instead of the Gruyere because it was on sale. I am so glad this turned out so well for you Hailey! Thank you! Hello! 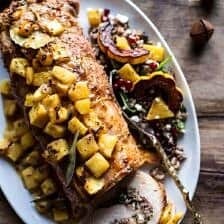 Planning on making this gorgeous dish for Thanksgiving! Could you please provide some clarity on how much butter to use when pre-baking the croissants and then how much to add to the skillet for the veggies? Thank you! Have a happy Thanksgiving! would rosemary be overkill in here? 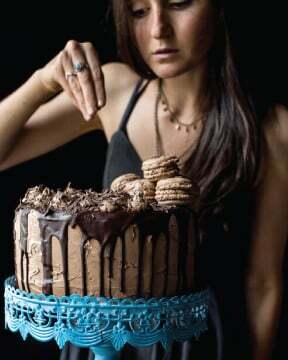 I’m making this right now!! I hope you love this Maria! Thank you! This was delicious!! I cut down on the butter slightly, but other than that it was amazing. I made this for thanksgiving today and it was a huge hit. Thanks for sharing! I am so happy to hear that Lea! Thank you! I am so glad everyone loved it Michelle! Thank you so much! I made this recipe for Thanksgiving and it was a hit! I usually stress out over making a dish for the holiday that will feed a lot of people, but this was super easy to make (& I personally do not consider cooking to be one of my strong suits), the overall cooking time was almost exactly as listed, and everyone enjoyed it. Especially delicious right out of the oven. I didn’t even follow the measurements 100% exactly and it still came out great. Thanks for this recipe! Thank you so much Noelle! I am so glad you loved this stuffing and it turned out so well for you! I made this stuffing for Thanksgiving and it was everyone’s fav dish! I love your recipes and photography. Hi Chrystal! Welcome to my blog! I am so glad you found it. My inspiration comes mostly from my family because they are always traveling to new countries and trying new dishes! 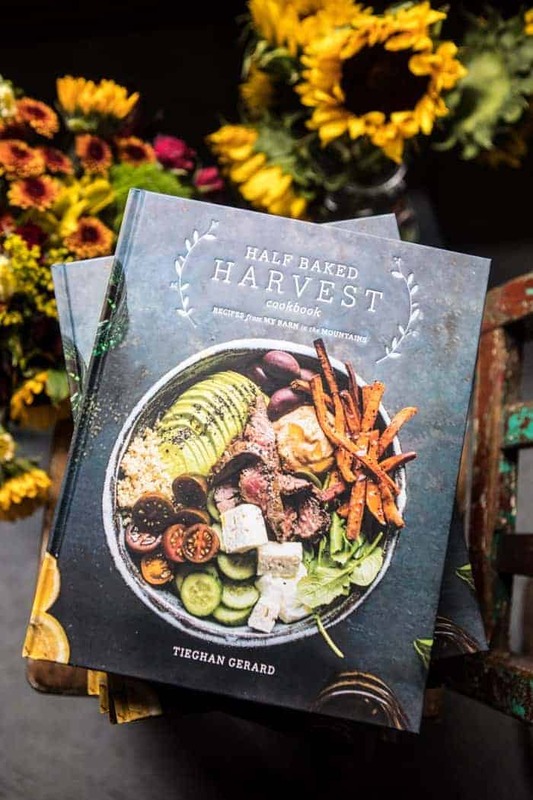 I hope you love the cookbook and let me know when you try! Thank you! Anyone who has made this have an idea of how many ounces of croissants they used? Thank you!!! My daughter made this for Thanksgiving and it was a hit. Now, making it for Christmas. YUM!!!! So awesome! I hope you all loved it Aida! Thank you! This was the best thing I ate of all Thanksgiving! I come from a small family who brings a lot of food and my husband and I were grateful for the leftovers. This recipe made SO MUCH we were even able to share with friends who joined us after the holidays and the reviews were raving time and time again. Looks like this may be my new signature dish come future holidays. Great job, Teighan! I am so glad everyone enjoyed this Brittany! Thank you so much! Made this on Christmas, it was very well received. I liked the flavor of the stuffing so much , last night I made just the mushroom/kale mixture (w/ celery, onions, etc) and served that with my pork tenderloin. And then used the left over mushroom mixture and put it on a grilled cheese tonight! Delicious. I am so glad you loved this stuffing, India! Thank you so much! Made this last week…will make it again. It is very rich so it will be for special occasions, but it is very good. It had to be with all that butter in there! This was a huge hit for Easter dinner. It was so good, my sister in law and I we’re eating it right out of the pan after dinner… very classy.